This quest took him to Canada where together with his fellow scientists, So Kawaguchi, Robert A. King, Christian S. Reiss, Tsuyoshi Matsuda and Taro Ichii, he made revolutionary discoveries in this field. They could determine the age of crustaceans by counting rings in hidden-away internal spots in those animals. Before their discovery to determine the age of a lobster for example, scientists would study its size and other variables. It was an unreliable source of information because, for instance, lobsters go through a molting period and shed their calcified body parts that have any information about them. 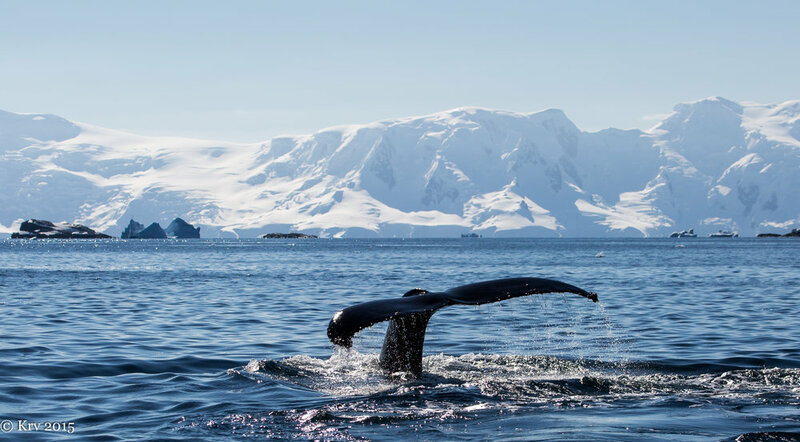 They have started on phase two of this project and will be collecting krill from different areas in the Antarctic region to compare their ecology, age structure, and survival rate. Krill is an important part of the ecosystem of the Antarctic region, but why is it so important to know its age? Kilada explains that this information is especially crucial for managing krill fisheries. If they are fishing in the areas with young krill population, it can threaten the further growth of krill and the rest of the ecosystem. 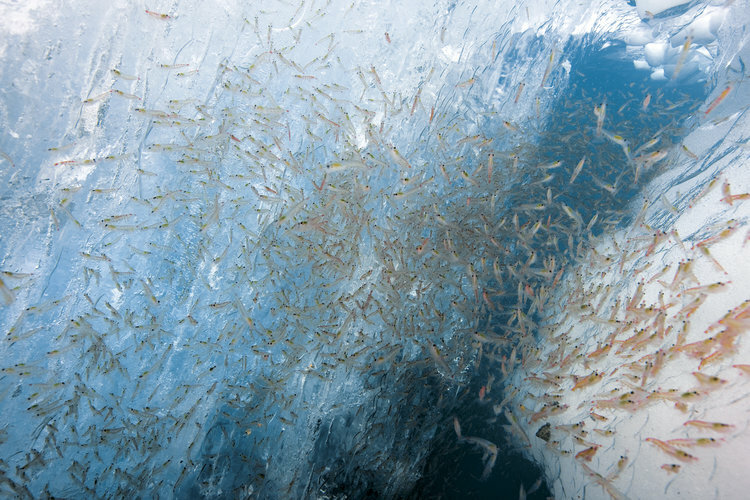 How do climate change and the rising temperature affect the krill? Kilada is currently starting his research lab in Halifax in Eastern Canada. He is going to work further on this topic with governments, universities, and industries. Kilada is focusing on krill in California, red king crab from Norway, and other species. “Krill is a phenomenal animal and has a very complicated life cycle and dynamics. We need to understand the biology, chemistry and physics around what affects the krill behaviour,” says Mingshun Jiang, oceanographer and associate research professor at Florida Atlantic University. In 2016, he and Christian S. Reiss of the US National Marine Fisheries Service were awarded a grant from the Antarctic Wildlife Research Fund to study Antarctic krill. Why is it important to research krill? “Krill are eaten by whales, penguins, fish, and krill eats the plankton and the smaller animals. So, the energy they concentrate by eating the plankton is transferred through the whole food chain, which makes them a fundamental link in the food web of the Antarctic,” says Reiss. The marine ecosystem around the Antarctic Peninsula is experiencing significant changes, including reduction in sea ice cover. These changes impact the entire ecosystem, including krill. “It is important to study krill's response to these changes and how it affects species dependent on krill. Will they become abundant because of the fewer krill? How many krill can the Southern Ocean support? Those are some of the big science questions when it comes to krill research,” says Reiss. What are the main goals with your research? “We try to understand a fundamental question of how important are the physics of the environment in the Antarctic and linkages between different species in the ecosystem. The first thing we are doing is understanding and describing the distribution and movements of krill, its behavior, the potential effects predators and fishing have on krill,” says Reiss. “The basis of these is studying the so-called connectivity and retention of krill, which describe how krill populations are connected and the sources and export of krill in a particular area”, adds Jiang. The results of this research will help fisheries develop more sustainable practices and design strategy to protect this fragile ecosystem. “The krill fisheries are concentrating on small areas. 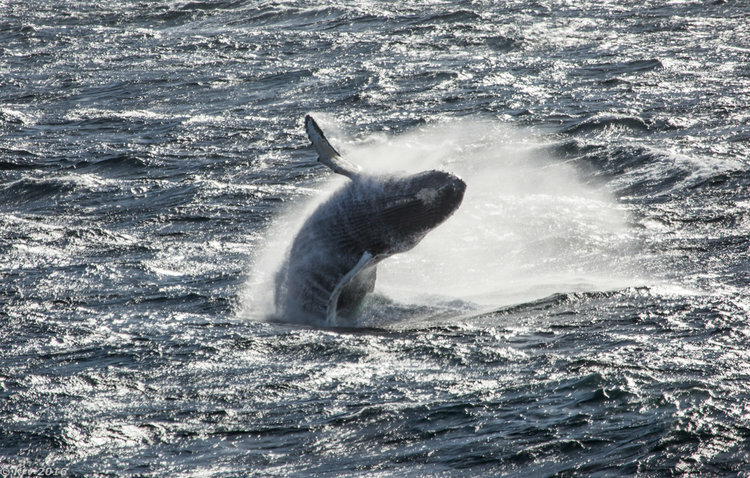 The question is how much it is possible to fish in those areas without removing krill faster than they replenish and without impacting the predators,” says Reiss. In order to address these questions, the scientists are using more than 15 years of data collected by Reiss and his colleagues. Jiang has developed a high resolution numerical model to better understand the spatial patterns of krill connectivity and retention. Output from simulations and this model will be available for public access and can be used by other scientists. Conducting research in the Antarctic is extremely interesting as every day brings obstacles and special encounters with both the physical environment or the biology that surrounds us. For example in recent cruise we saw nature revealed in two amazing ways. In the Bransfield Strait we were collecting krill and moving along from station to station. Towards the afternoon, as we approached a station to begin sampling, a Humpback whale began to swim near the ship. Within 20 minutes we were amazed to see more and more Humpback whales arrive and begin spy hopping, tail flapping and diving under the ship. As more and more scientists and crew went to the deck to observe these whales (all ideas about sampling immediately suspended) the whales also seemed to become more animated as if they were as excited to see us as we were to see them. This response has been described by many people but it never ceases to amaze. During the same cruise we endured the awesome power of the physical environment when storms arrived. Winds in the Antarctic during summer are usually relatively low except when storms come through. In this particular year, after seeing the power of the biggest animals on the planet, the barometer started a frightening decline with a corresponding increase in the winds and waves. What looked like a normal storm continued to increase in intensity such that we tried to shelter in Deception Island, the famous caldera that has been used as shelter for a hundred years. Rather than declining, the winds continued to intensify and the captain, who tried many times to anchor within the bay to no avail, finally drove the bow of the ship onto the forgiving volcanic sand shores and kept the propellers and the engine engaged. We stayed attached to the beach for several hours while the storm passed. By the next morning, a bright sun, calm winds and declining seas enabled us to get back to work, wondering why we are fortunate to see and experience such amazing beauty and power in such different ways. Every year, month, week, and day in Antarctica is different. From year to year the whole timbre of the landscape can change with the ice conditions. From day to day the weather can turn on a dime and turn a peaceful and tranquil vista into a dark and wind-battered curtain of snow. Through it all, the animals that make this place home weather the storm and we must do the same. Working with whales requires an ingredient list that would rival a witches brew. We need to have whales, whales behaving in a manner that allows us to get close to them, daylight, calm seas, little wind, a platform to work from, etc. When these things all line up we have to be ready to take advantage of the time and work efficiently. Once these elements come together we focus our efforts. This morning, we have calm seas, fair winds and a glorious display of morning light filling the sky at 4 am. The horizon is peppered with the blows of humpback whales, the 20 foot-tall columns of vaporized water hanging above the sea for a few seconds offers evidence of where the whales were. At least 15-20 on a quick scan from the bridge of the ship. This is the perfect opportunity for us to work. I prepare our biopsy gear, satellite and suction cup tags and assemble the team for an early morning on the water. We talk about our goals; we would like to deploy a multi-sensor suction cup recording tag to understand the fine-scale movement and foraging patterns of the whales for 24 hours, deploy a long-term satellite tag that will show us the movement patterns of the animal throughout the entire feeding season, and collect a number of biopsy samples that will elucidate the population from which these whales came as well as if they are male or female. From the small inflatable boat, I direct the driver from a pulpit that sits above the pontoons and always be a slightly higher view from which to see the whales and a platform to lean out just enough to tag the animals. We find a number of animals bubble-net feeding, creating spiraling circles of bubbles underwater to concentrate or aggregate the krill and then lunging up through the center with mouths agape to feed on the small crustaceans. When the whales do this, it is obvious where they are likely to come up and once they do, they are trapped at the surface for half a minute while they sift all of the water out of their mouths before going down once again for another foraging bout. We slowly approach a bubble net as it forms at the surface and when the whales come up, we idle in their direction. I communicate with the driver where the whales are and where we need to position ourselves to place the suction cup tag on the whale’s back. When it arches to dive, the whale shows us a fine piece of real estate and with a gentle thwack, I place the tag on the whale. The tag sits at the end of a 25-ft carbon fiber pole that looks like a giant magic wand and it does not take much effort to place the tag on. As soon as the tag is deployed my graduate student collects a small skin and blubber biopsy sample using a crossbow and customized tip that takes a small sample about the size of a pencil eraser. Once the tag is deployed we can listen for it with a VHF antenna and receiver. Whenever the tag is above the surface (either on the whale or once it has fallen off and floats) we hear a signal and can keep track of the whale’s location. We spend the rest of the morning following the blows in the early morning air and collecting biopsy samples. The tag will stay on the whale for about 24 hours and then fall off. When it does, we use the tracking gear to locate it and retrieve it. The data are stored on the tag so we have to get it back in order to get the data. When we do it is a flurry of downloading, running code, and generating figures. Our tag is out now, on a humpback whale maneuvering through the icy depths. When we retrieve it, we will see the motion of the whale, count how many times, where, and when it feeds and how these massive ocean giants make a living in the Antarctic. Working in polar regions, especially during summer, can be a challenge. While life on a modern research ship is comfortable, the everlasting days and lack of night time can drain you. With nearly constant daylight, the opportunity to search for whales and work with them never ends. As well, the evening and early morning light are magical and one can’t help but be entranced in the pastels and vibrant colors beaming from the horizon while the sun scrapes just below it for a few minutes. Our research vessel, the ARSV Laurence M Gould, hosts about 25 scientists and nearly that many more officers and crew. The ship is active 24 hours a day and scientific teams generally are split into two shifts, each for 12 hours. My team, however, is on call whenever it is light out, whenever there are whales around, and whenever we have the opportunity. When the ship is in transit between oceanographic sampling stations, we maintain a watch on the bridge to log sightings: species, group size, location, behavior, etc. If we come across an unusually large number of animals in a small area or have time before the next station is to occur, we take the opportunity to deploy our RHIB (rigid-hulled inflatable boat) to collect biopsy samples and deploy satellite tags. Spending so much time on the bridge, we see all of the wonders of the Antarctic as they pas by; sea birds, seals, penguins, ice bergs, mountains, etc. You begin to get a feel for the environment and where the whales are likely to be found. Maintaining a schedule is important on the ship to create a sense of stability. Meals are pretty early and the ships are well stocked with fresh foods that last for about three weeks. After that…things become a bit more routine and less exciting. But the galley crew do a wonderful job of keeping us well fed and healthy! Our cabins are small but comfortable, all have bunk beds and a private bathroom with shower. Two scientists to a cabin, a small desk and storage space for personal gear and clothes. Most other things remain in our labs and working space. A porthole lets us see the passing world. It is critical to be able to shut it though and block out the constant light and sleep in darkness. Routine is important, and on the ship we have a small gym and comfortable lounge where people can watch movies on a big TV. There is also a satellite phone to call home and keep in touch, as well as email. While all of the amenities help to maintain a sense of being in touch, the Antarctic is so unique that you find yourself failing to explain and express the place to friends and family in words or images. As the whales we work with are not on a schedule or found at known locations, we work whenever they are around regardless of the time. I average about 4 hours of sleep a day with an occasional nap. It isn’t sustainable for more than a month or so, but well worth it! Each evening we put together a science plan for the following day that includes, to the best of our ability, the times and locations of where we will be. In all of my time in the Antarctic, rarely does a plan accurately forcast what we will do the next day. The Antarctic has a way of making you change your plans constantly to adapt to the changing conditions and opportunities. During our research we are aboard research vessels. This year I was aboard the British ship the James Clark Ross. This is a world class research vessel that has berths for more than 20 scientists and laboratory spaces to conduct all manner of research. The heart of the research operations on this ship is the UIC. The underway instrumentation and control room. This is the nerve center of the science where all data streams are visualized so that decisions regarding the science program can be made. From this room, winches and deck gear can be operated allowing the sampling to be monitored. On the deck, scientists will deploy a variety of gear over the stern of the ship with the help of an excellent deck crew, all under the careful watch of the Bridge. In general, aboard research vessels work is conducted 24 hrs a day so that people are always on shifts. Aboard the James Clark Ross this year I worked from 4 AM to 4 PM which took some adjustment! My work this cruise consisted of running acoustic data collection for krill, sampling the water properties using an instrument called the CTD, that measures temperature, salinity, oxygen, chlorophyll-s and the clarity of the water. Additionally water samples were collected for other collaborators that’ were conducting other studies in conjunction this cruise. My colleagues on the night watch also sampled krill, mesopelagic fish and conducted studies on krill swarms to better understand the acoustic properties of krill in swarms. The collection of samples was limited to night-time to minimize avoidance of animals to the net, and to capture animals that vertically migrate into the upper water column at night. One of the best parts of being on a cruise is the food, especially when the cooks are great. I was fortunate on the James Clark Ross as all the meals were wonderful. And the one perk of getting up at 4 am is that I was able to eat all three meals, breakfast lunch and dinner. The mealtimes are also important times to exchange information with the officers and other scientists so are valuable from the scientific perspective. On this cruise I was berthed in a small but comfortable to person room. And, because we didn’t have a large number of scientists, there was no other person in the bunk. This was helpful in providing a private space away from everyone, necessary when you are all on the same 100m boat! Life at sea is regimented, and is very repetitive. The close proximity to others provides an opportunity to interact closely with people and see the world in a very unique and special way. The two best days at sea are often the day you leave port and begin the journey, and the day you return to port and can share the experiences with others.